3rd December 2018, Cambridge, UK – Biosimilars are a hot topic for the NHS, the companies that make them and of course the patients who receive them. There is an ongoing dialogue about biologically similar medicines that doesn’t look to be subsiding anytime soon. Before the launch of the first large monoclonal antibody in the UK back in 2015, Napp had no experience of biosimilars and now nearly four years on our medical and scientific teams are at the forefront of biosimilar education. Our efforts to deliver industry leading biosimilar education for healthcare professionals, NHS decision makers and patients has supported strong uptake and adoption of these medicines in the UK health system, ultimately saving the NHS money that can be reinvested in services. In November Napp’s Managing Director, Hywel Day, spoke exclusively to Raconteur about meeting the challenges of biosimilars. 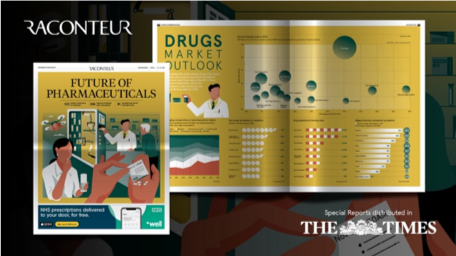 The article was featured in the “Future of Pharmaceuticals” special report in The Times newspaper, with commentary from other industry leaders, in-depth analyses and discussions around the innovations that will drive pharmaceuticals in the future. The article is available to read online on the Raconteur website. Please click here to read the full issue, and Hywel Day’s article on page 16.